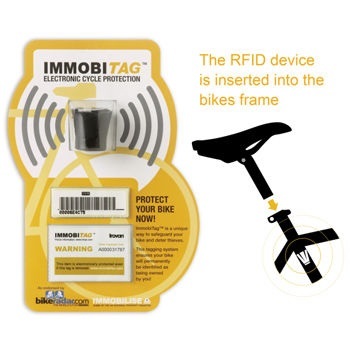 The ImmobiTag bike identification tag, along with a good lock, is the first essential accessory you should have for your bike. A bike is stolen every 71 seconds in the UK. The ImmobiTag can’t stop your bike from being stolen, but it can significantly improve the chances of your bike being recovered by the police. ImmobiTag is an easy-to-fit electronic tag emitting a unique ID signal. The tag is embedded into your bike frame and is almost impossible to remove. The tag can be detected using a hand-held scanner, which displays the tag’s unique ID number. This can be used to identify the owner of the bicycle, and prosecute the thief. ImmobiTag is registered on Immobilise – The UK national property register and is linked to all UK police forces. If you have ever had your bicycle stolen you will remember the anger, upset and inconvenience it caused. 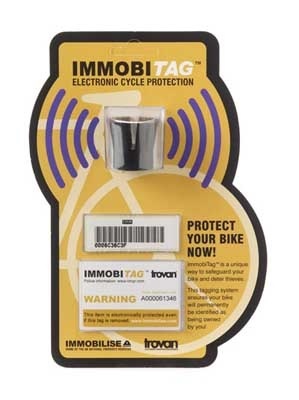 Ebike Centres strongly recommends that everyone fits a security chip and for that reason we offer free fitting of the tag for any customer who purchases one from our shop.